The National Fire Protection Association (NFPA) 70E is a comprehensive standard that establishes best electrical safety practices standards on how to protect industrial workers from electric arc flash and arc blast exposure and resulting potential injury and death. OSHA has referenced this electrical safety standard in numerous cases. In fact, many organizations have now designed an NFPA 70E Compliance Guide to help protect their electrical personnel from the hazards associated with arc flash. OSHA adopted regulations on safe electrical work practices in 1990 based on NFPA 70E, and is proposing a revised standard that conforms to the most recent editions of NFPA 70E. Given that the NEC (National Electrical Code) and OSHA have both started referring to it in their documents, citations are now being written based on NFPA 70E. NFPA 70E applies to employees who work on or near exposed energized electrical conductors or circuit parts. This includes electrical maintenance personnel, operators, troubleshooters, electricians, linemen, engineers, supervisors, site safety personnel or anyone exposed to energized equipment of 50 volts or more. The goal of the standard is to keep electrical workers free from the hazards of shock, electrocution, arc flash and arc blast. According to the NFPA, shock, electrocution, arc flash, and arc blast are responsible for one fatality every workday in the U.S., and some 8,000 workers are treated in emergency rooms for electrical contact injuries each year. 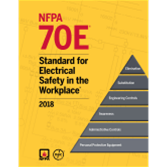 Now NFPA 70E – the Standard developed for OSHA – is revised to address safety gaps and increase electrical worker protection, while helping companies comply with OSHA 1910 Subpart S and OSHA 1926 Subpart K. Major changes recognize new hazards and address safety gaps. Personal Protective Equipment (PPE) protects personnel and can significantly reduce the risk of injury in an arc flash. To help electrical engineers calculate incident energy – the vital first step in determining the correct type of PPE for a given task – Informative Annex D consolidates all equations, adds new tables, and offers more options to detailed calculations. The NFPA 70E Standard for Electrical Safety in the Workplace is revised and updated on a three year cycle. The most recent edition to be released was the 2018 edition. To further reduce the risks for second-degree thermal burns, cotton outerwear is no longer permitted for energy levels below 2 cal/cm2. An expanded Table in Article 130 covers added tasks such as thermographic imaging, and new equipment including arc-resistant switchgear. Added Article 350 provides first-time requirements for the protection of electrical personnel in R&D labs. A new exception verifies that 240 V and less power systems fed by a single transformer less than 125 kvs no longer require an arc flash hazard analysis. Expanded requirements for multi-employer relationships address potential areas of oversight. New recordkeeping requirements for training and safety program audits answer OSHA’s need for records. The NFPA 70E Standard continues to advance to address risk assessment and introduces human factors, such as human error, as part of that assessment. Annex Q, Human Performance and Workplace Electrical Safety, is included to provide direction. NFPA 70E emphasizes the need to use the hierarchy of risk controls, by moving it from an informational note into the text of the actual Standard. NFPA 70E now clearly states that the first priority must be the elimination of the hazard. A key change throughout the NFPA 70E Standard includes replacing the phrase “hazard analysis” with “risk assessment”. New requirement 320.3 (A)(1) covers risk assessment associated with battery work. New subsection in 130.2 (A)(4) provides requirements where normal operation of electric equipment is permitted. Revisions enhance usability; such as the division of requirements in former 110.4. (C)(2) into new sections separating construction and maintenance work from outdoor work. Updated tables add clarity to requirements, such as the restricted approach boundary dimensions in Table 130.4 (D)(a). Understand the Risk Assessment Procedure with clarification and sample worksheets in Informative Annex F.
Develop and review plans for compliance using Informative Annex O–Safety-Related Design Requirements. We have NFPA 70E Electrical/Arc Flash Safety Training Classes designed for industrial workers of all levels including both qualified and unqualified workers, management and more. We can customize our training classes and programs specifically for your industry, facility, and specific needs/requirements- just ask!